Imagine running as fast as you can - into a wall. Do you think you could stop yourself if the wall suddenly loomed up when you were two feet away? This is exactly the situation you face when the front of your car hits something at only 15 mph. That's bad enough, but at 30 mph you hit the wall four times as hard or with the same impact you'd feel as if you fell three stories. Now picture that every time you get into a car without buckling up or doing so properly. We are our kids' greatest examples. As such, it stands to reason that if we're not doing as we should in the car, they won't either. Why should they? You don't see it as important and you're the wisest person they know, according to them. In other words, you can trust me. The standard three-point seatbelt is meant to support your body over its strongest parts - hips, chest, and shoulders. 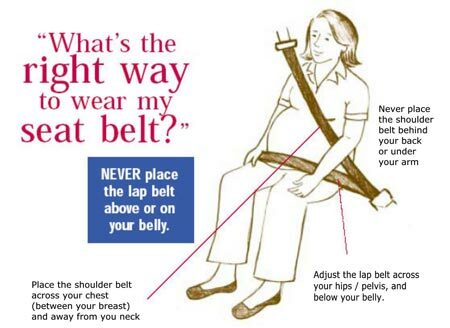 If you wear your seatbelt properly, your shoulder strap will be halfway between the crook of your neck and the end of your shoulder, diagonally down over your sternum (not off to one side or the other of your breasts), and over your hips (not on your belly). During the first tenth of a second, the front bumper and grill collapse. In the second tenth of a second, your hood crumples, rises, and strikes the windshield. Spinning rear wheels rise from the ground. Fenders begin wrapping themselves around the tree. The car frame is effectively braked, but your body is still moving at 55 mph. Instinctively, you stiffen your legs for the jolt, but they snap at the knee joint. During the next tenth, your torso catapults from the seat. Broken knees ram into the dashboard. The steering wheel begins to collapse and the steering column drives toward your chest. In the fourth deadly tenth of a second, two feet of the car's front are totally demolished, but the rear end is still rushing onward at 35 mph. Your body is still traveling 55. Half a ton of motor plunges into the tree and the car's rear rises as high as the tree's lower branches. In the fifth tenth, you are impaled on the steering column Blood spurts into your lungs. During the sixth tenth, the force of impact has built up so that your feet are ripped out of tightly fastened shoes. The brake pedal shears off, the car frame buckles int he middle, your head bangs into the windshield while rear wheels, still spinning, fall back to earth. And in the seventh tenth second, the entire car body is distorted. Hinges rip. Doors spring open. The seat flails loose, striking you from behind, but it doesn't matter, you're already dead. You aren't around to experience the final three tenth of this horrible second. Neither are your children. A great many of you are not wearing your seatbelt properly, if at all. I know, because some of you are my friends and I see pictures. A great many of you are not properly buckling your children, whether it be in their carseats, boosters, or standard seatbelt. I know, because some of you are my friends and I see pictures. I talk to you, of course. You blow me off, not surprisingly. Don't. Don't risk it. Don't be the one who says, "If only I had listened" beside your child's hospital bed or worse their grave. It's a juvenile attitude that it will never happen to them. It's terrifying how wrong they are.